The UICA is set to screen The Reluctant Fundamentalist for the next two weeks. 6/7 Friday – 3:00, 8:30 p.m.
6/8 Saturday – 3:00, 8:30 p.m.
6/9 Sunday – 1:00, 7:00 p.m.
6/11 Tuesday – 9:00 p.m.
6/12 Wednesday – 8:30 p.m.
6/13 Thursday – 8:30 p.m.
6/14 Friday – 12:30, 5:30 p.m.
6/15 Saturday – 12:30, 5:30 p.m.
6/16 Sunday – 4:00 p.m.
6/20 Thursday – 5:30 p.m.
Mira Nair’s film adaptation of The Reluctant Fundamentalist opens at the UICA this weekend. Based on the novel of the same name, it follows the trajectory of Changez Khan, a Pakistani student who comes to America in the late 90s in search of the ever-elusive American dream. 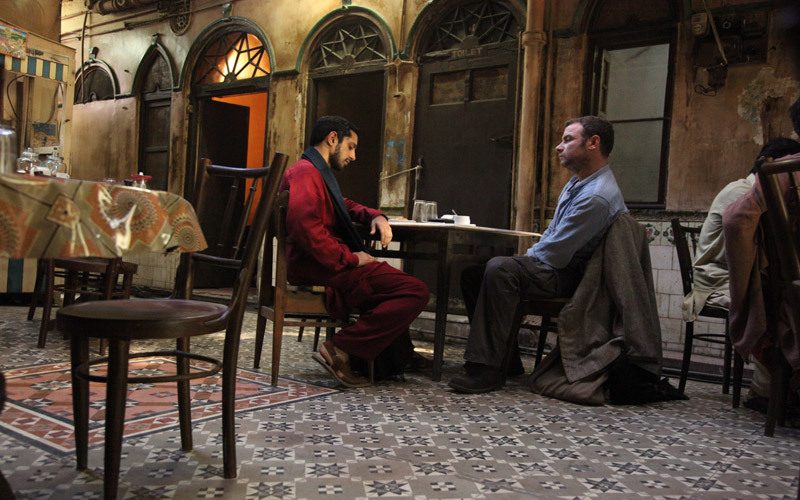 The film opens in a small restaurant in Lahore, Pakistan where two men are sitting at a table off to the side of the room. Bobby, an American reporter, is interviewing Changez following the disappearance of an American professor. Their subsequent conversation takes the narrative through Changez’s life in America. Roughly the first third of the film sets up Changez’s new life, which begins on an immensely promising path. After graduating top of his class from Princeton Changez lands a job at a top firm on Wall Street. Our time on Wall Street is framed with a shot of the New York skyline with the year “2001” appearing beneath it. The skyline is complete with the World Trade Center. From his first day on the job Changez’s skill and potential become obvious, quickly making him a favorite for promotion. His success in his adopted country appears to be unstoppable until, while on assignment in the Philippines, he sees the Twin Towers collapse on his television screen. Though Changez doesn’t immediately grasp the personal implications September 11 will have on his life, the viewer- more seasoned and familiar with this narrative than our protagonist- has every idea. The months (and approximately hour and fifteen minutes) that follow take Changez and the viewer down a path that though not unfamiliar, is no less disheartening. The narrative in The Reluctant Fundamentalist is so convincingly told that it becomes hard to watch at various points. It’s a reminder of the downward spiral American foreign and domestic relations took following 9/11. At first I comforted myself in a blanket of the film’s origins. “Oh, but it’s just a novel,” I thought as Changez’s daily experiences began to change. My state of denial lasted only a moment as I remembered that for many Americans this narrative would seem only too familiar. The film’s pacing is fairly effective. The narrative jumps between America and Pakistan with just enough regularity. It serves as a break from each narrative right around the time I found myself needing one. Because the film starts with an older Changez in Pakistan, the viewer knows that at some point he abandons his American life and returns home. As a result there’s a consistent level of tension throughout the film that never becomes overwhelming, but holds the viewer’s attention throughout. Overall I found the film to be insightful, beautifully filmed and very well acted. The tone and quality of dialogue are engaging and intelligent, while remaining accessible. Though some might be ready to accuse The Reluctant Fundamentalist of being heavy-handed, I found its message to be a potent one. It’s easy to look back at a country’s history and cringe. We lost our sanity after 9/11 and quickly extinguished any goodwill the international community felt for us through the reactionary paths we took into the Middle East. But this movie ultimately left me thinking it wasn’t too late to learn from our history. It’s a cautionary tale: The Reluctant Fundamentalist can be a reminder for the future, of how not to conduct ourselves should we face a situation like that again. The Reluctant Fundamentalist opens Friday June 7 and runs through June 20 at the UICA.